Summertime is here, even though the official start isn’t until next week. But schools are out, the weather is warm, and it’s time for seasonal fruits and veggies. One of my favorite parts of Summer is being able to buy fresh cherries at the grocery store. I believe the best way to eat seasonal fruits is in a freshly blended smoothie, or maybe an indulgent dessert too 😉 But we’re trying to keep things a bit healthier today. Usually after my morning workout I blend some fruit and protein for breakfast to refuel my body. 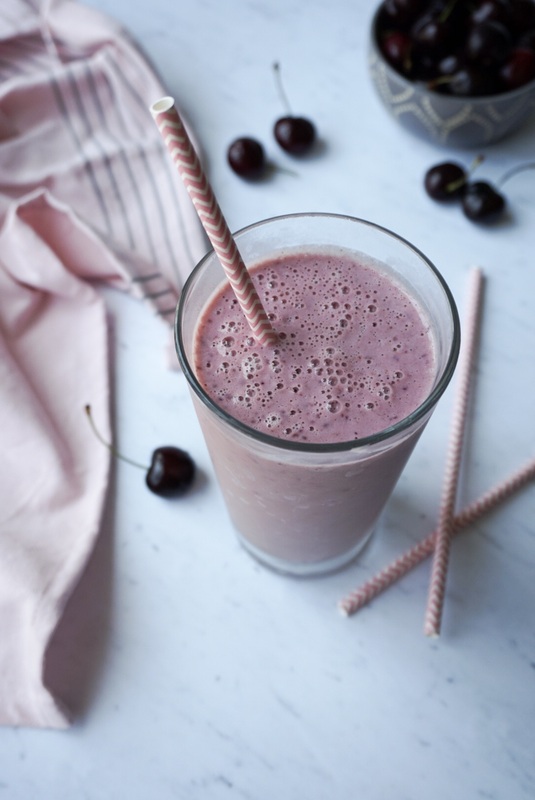 This Cherry Pie Smoothie Recipe is refreshing on a hot day and tastes like one of our favorite summer treats. The smoothies uses fresh cherries of course, oatmeal, yogurt, and almond butter for the ‘pie’, and a little almond extract for extra flavor. I also like adding some greens or vegetables to my smoothies, so I throw in a handful of spinach, kale, or use the newest trend, frozen cauliflower. Hello sneaky extra vitamins! This is completely optional, but I promise you won’t even taste it. Simply add all the ingredients to a high powered blender, this tasty treat takes less than 5 minutes to make. Occasionally I’ll add extra protein powder when making a smoothie with greek yogurt, but since the yogurt has a decent amount of protein it’s not necessary. Feel free to add a scoop of vanilla or maybe even chocolate. Shakeology, Naked Whey, and Vega are some of my favorite proteins. 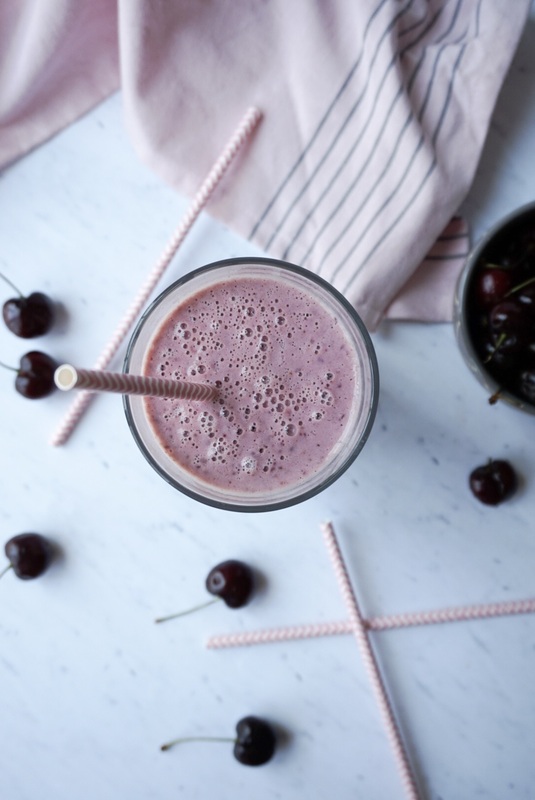 This Cherry Pie Smoothie is naturally sweetened, make with quality ingredients, and is a refreshing summer treat. Add all the ingredients to a high powered blender. Blend until smooth. Add more milk to thin or more ice to thicken. Serve immediately. Linking up with Jenn and Laura for What I Ate Wednesday and Esther, Annmarie, Farrah, and Jess for Foodie Fridays. And you can view other Smoothie Recipes Here. 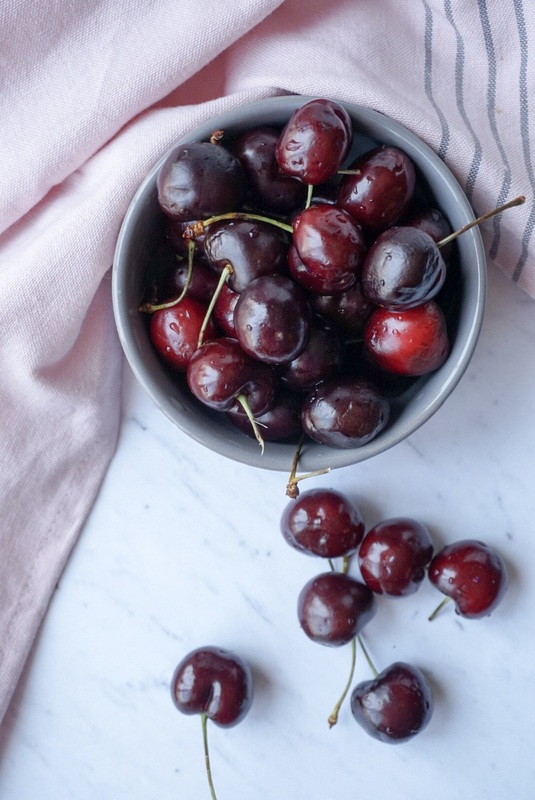 What do you make with fresh cherries? What’s your favorite summer fruit and/or vegetable? Tell me something delicious that’s been on your plate lately. This looks amazing! Adding frozen cauliflower is a brilliant idea. Does it add creaminess, kind of like the texture of bananas? Also, I recently tried the chocolate flavored Vega, and holy yum. It’s so, so good. Yes it does add a little creaminess like frozen bananas! Give it a try and let me know what you think! Ah the cherries right now are amazing! I just had some fresh ones on Sunday! They’re the best right. I used to be all about strawberries and peaches in the summer, but now obsessed with these! This smoothie recipe looks and sounds amazing! 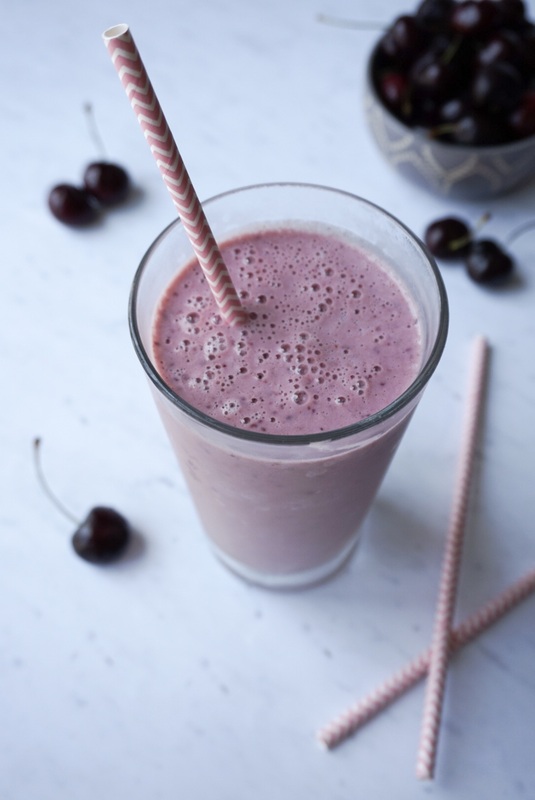 I’ve been hoarding my cherries like crazy – this smoothie sounds like the perfect way to put them to use! OMG 108 degrees. All I would eat is smoothies! Let me know if you try it. This sounds so good and refreshing! I love adding cauliflower to smoothies, great volume! I have recently been adding frozen cucumbers as well. Cucumber, genius! Need to try that. Yum! I am all about the cherries, we buy the frozen ones at Costco, so we usually have some on hand. I love the idea of using a little almond extract for extra flavor. Yes, almond extract is in most cherry pies, so I though why not add it to the smoothie?!? I have a smoothie similar to this on my blog I make. I LOVE adding the cauliflower! Sounds weird but it makes it all creamy and yum. The almond extract is a great idea! My husband was so weirded out by the cauliflower at first, but he said he definitely couldn’t even taste it. I’ve been obsessed with cherries since getting back from Northern California where I ate them off the tree! Wish I could get them that fresh again! OH cherries straight from the tree! That sounds amazing. I just fell in love with cherries a few years ago and have been obsessed. Stinks they’re only a season fruit though. And YES OHIO! Where do you live? I’m hoping to make it back home sometime this summer. I don’t think I’ve ever made a cherry pie, since I call myself a baker I should probably get on that. Frozen cauliflower is my new favorite add-in…I love the extra nutrients and creaminess it adds! This smoothie looks fantastic. Yes it makes the smoothies so creamy! This sounds SO refreshing for summer!! I haven’t tried frozen cauliflower in a smoothie yet but says it’s so good!! My favorite summer veggi is grilled yellow squash!! Mmmmm I love some grilled squash and zucchini in the Summer! I always like making them with kabobs. This smoothie looks so good! I’ve made one with frozen cherries but not the fresh stuff, I’m sure it makes a huge difference! I debated on using frozen for the recipe, but the fresh cherries at the grocery store were just calling my name! Hope you give this one a try. It is! Hope you’ll give it a try.